President J. Reuben Clark, Jr. (September 1, 1871 – October 6, 1961) was a prominent attorney who served as Under Secretary of State during the presidency of Calvin Coolidge, and later as the US Ambassador to Mexico. 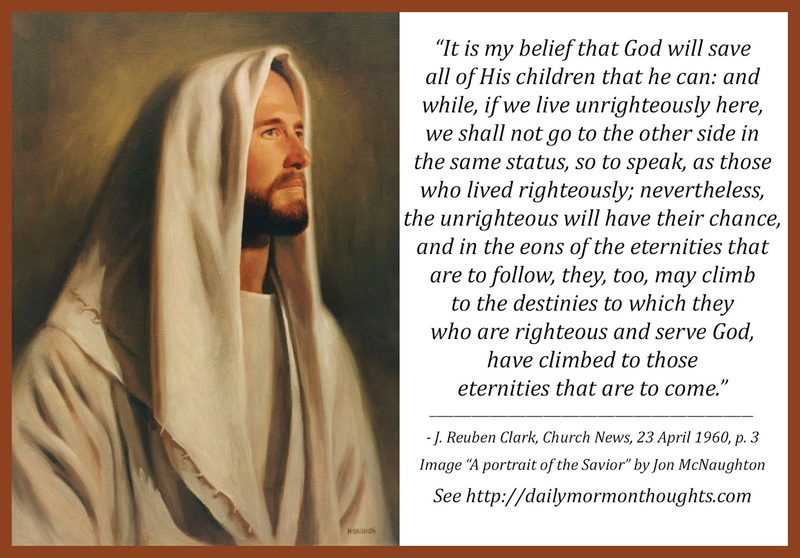 He was called as a counselor in the First Presidency to Heber J. Grant starting in April 1933, and was ordained an apostle a year and a half later. 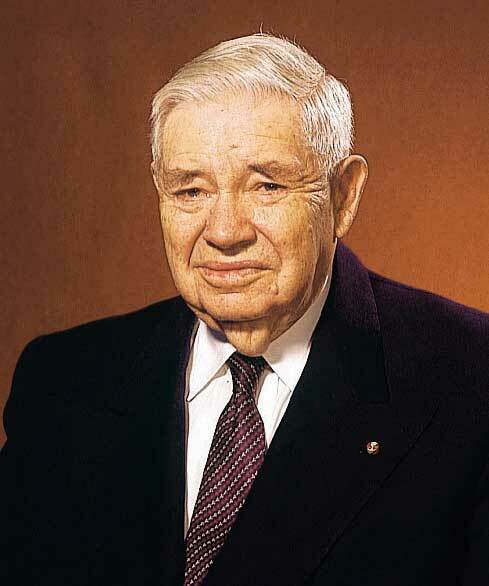 He went on to serve as counselor to Presidents George Albert Smith and David O. McKay before he passed away in 1961 at age 90. "I am not a strict constructionalist, believing that we seal our eternal progress by what we do here. 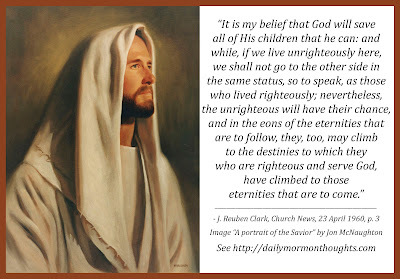 It is my belief that God will save all of His children that he can: and while, if we live unrighteously here, we shall not go to the other side in the same status, so to speak, as those who lived righteously; nevertheless, the unrighteous will have their chance, and in the eons of the eternities that are to follow, they, too, may climb to the destinies to which they who are righteous and serve God, have climbed to those eternities that are to come." This is a fascinating excerpt. There is much we don't understand about the eternities, and sometimes what we assume is a doctrine has not been officially pronounced to be so. That is the case when our eternal options of progression are considered. "When you climb up a ladder, you must begin at the bottom, and ascend step by step, until you arrive at the top; and so it is with the principles of the Gospel you must begin with the first, and go on until you learn all the principles of exaltation. But it will be a great while after you have passed through the veil before you will have learned them. It is not all to be comprehended in this world; it will be a great work to learn our salvation and exaltation even beyond the grave." We should be very grateful for a loving God who will do all He can to assist us in "working out our salvation" as long as we are willing to continue to do our part!